People often confuse weight loss with fat loss, thinking they are one in the same. In reality, this is not the case. For example, one person who weighs the exact same as another person may have a higher percentage of body fat. There are many factors that could be at play when considering the amount of body fat a person has. Genetics and lifestyle choices are the most common, and it is possible that you are one of those people who is at a healthy weight, but have more body fat than you would like. BIObind Fat Binder may be able to help you with this problem. The question is whether or not it actually works. Claims: To contain Slenmax a unique combination of ingredients, that are said to help fat from being absorbed in the body. 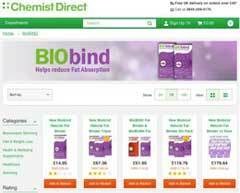 What is BIObind Fat Binder? Biobind Fat Binder is especially known for its highly advanced formula called Slenmax, which combines cactus extract, psyllium, and chitosan. Cactus extract has been used for over 12,000 years as a holistic healing plant, and can be found in Mexico’s volcanic areas. Many fifteenth century pioneers even went so far to claim that cactus extract could prevent scurvy. Because cactus extract contains a great deal of soluble and insoluble fibre, the extract is capable of absorbing toxins and water. Therefore, it plays a significant role in allowing your digestive tract to function adequately. In addition, cactus extract helps to block the rapid absorption of sugar into the body’s bloodstream during the digestion process, which aids in the burning of fat in the body. This, in turn, decreases the chances of the development of metabolic syndrome, as the extract also aids in the lowering of blood sugar and lipid levels. Furthermore, because of the extract’s high fibre content, you will feel full more quickly and consequently, your urge to eat excessively is diminished. 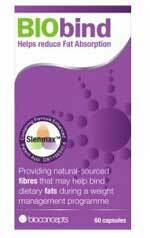 Psyllium’s primary purpose is to increase intestinal health and control weight. The ingredient comes from the plantain seed, specifically its husk. In addition to cactus extract, psyllium also contains fibre. It can help keep the digestive system fully functioning and clean. Just like the other two ingredients, chitosan also contains a great deal of fibre. Chitosin is derived from shellfish, and the ingredient has been proven to lower bad cholesterol and assist in fat reduction. 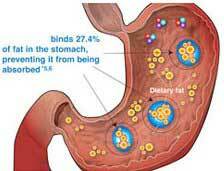 In fact, its sole purpose is to block fat as it is known to absorb fat molecules and fat intake by thirty percent. There is a lot of information about the ingredients found in BIObind Fat Binder, which can be found on the product’s website. The website gives a detailed description of each ingredient’s main functions, which is very useful. In addition, the product has undergone a great deal of scientific research, as it was created by a team of pharmacists and nutritionists. Lastly, the product promotes a healthy lifestyle and encourages a proper balance of diet and exercise. 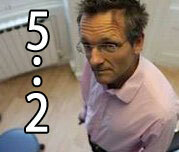 The product has also appeared in media publications such as the Daily Mail, Take 5 and Love It magazine. The main factor to consider when thinking about using BIObind Fat Binder is the cost. If you do the math, sixty capsules may only last you for ten days if you take the maximum amount of six per day. That means you will have to replenish your supply rather quickly. With the price at £14.95 per bottle, you have to decide for yourself whether or not this is worth it. In addition to the cost, it seems that there is not a great deal of convincing evidence that the combined ingredients are actually doing what the product claims, that is, burning fat. While the ingredients are in no way harmful to your body, it is possible that the product won’t give you the results that you want. Then again, it may be worth the shot. It would also be comforting if the product provided a money-back guarantee, which many of its competitors offer. Customers often take stock in a product when they know that the manufacturer has confidence in its product and can guarantee its success. Additionally, if the manufacturer provided more personal testimonials on its website, consumers might feel more convinced that this product actually works. A few intermittent reviews don’t suffice. Should You Try BIObind Fat Binder? The question remains. Is BIObind Fat Binder worth it? It is really up to you. While the product’s active ingredients certainly have some compelling functions, the lack of evidence to prove its success is disappointing. Of course, there is no harm in taking BIObind Fat Binder, but it does seem like a large investment that has no proof of giving you the results you desire. For example, there have been no trials or studies conducted on this product that show significant proof that it will make you that much leaner than you are today. There are a great deal of fat burner products out there, and many that offer a guarantee. Therefore, it might be more beneficial for you to try a product that customers and manufacturers can stand behind. 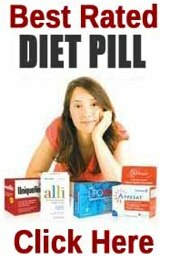 It is recommended that you take one or two capsules per day with every meal, but not to exceed six capsules in a 24 hour period. Your intake should be dependent upon the amount of fat your meal contains. A single bottle of BIObind Fat Binder costs £14.95 and contains sixty capsules. Available to buy from the manufacturers website. 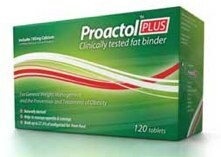 The fat binder market is very strong one with product brands such as XLS Medical fat Binder, Rasva (formally Xipisan) and Boots own Fat Control competing.